Do You Know My Neighbor’s Friend’s Cousin’s Sister’s Nephew? Have you ever traveled outside your country and met someone who asks you where you are from? Usually it is some guy who says, “My Neighbor’s Friend’s Cousin’s Sister’s Nephew lives in Alaska, do you happen to know them?” I always ask their name then politely answer, “No, I don’t think we’ve met. I don’t get out much!” In case you didn’t know, Canada is a large country. Oh you knew that? Well then, Canada has a smallish population about 32 million. Slightly less than the population of California, which sits at 36 million. The chances of me traveling to Belgium and meeting a family member of someone I know is slim to none. Or is it? The last time we chatted about my travels to Europe was here, before that it was here. 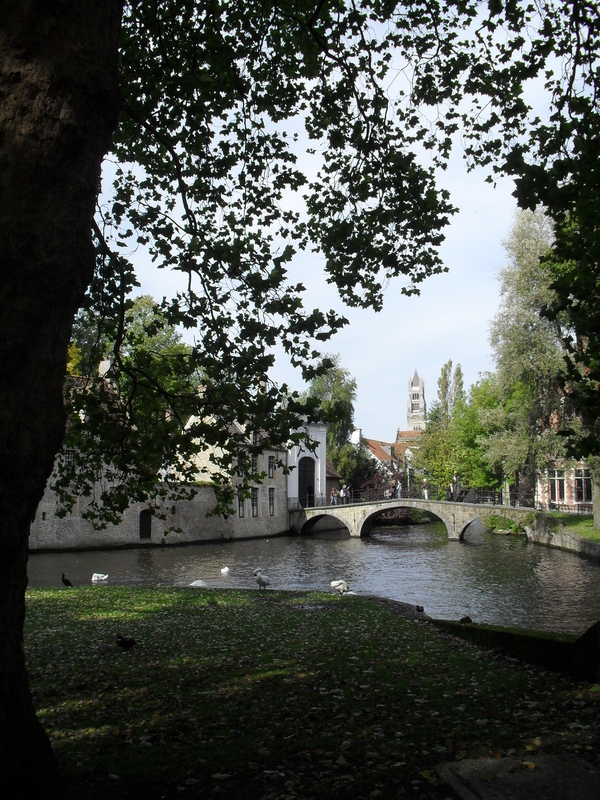 This is the story about the time I went to Bruges. 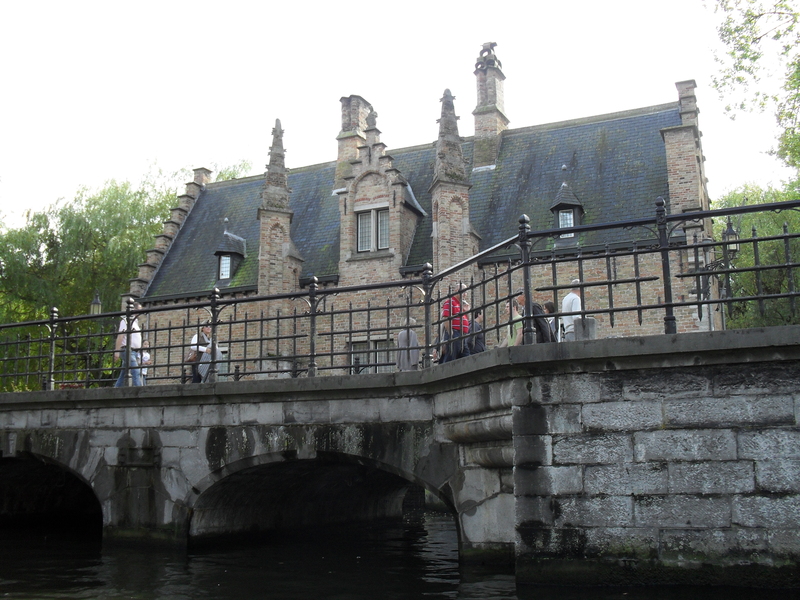 The entire cast of the Muppet Show was slightly rested and full of chocolate by the time we reached Bruges. This was a place that my Mom dreamed of going. I am THRILLED she thought it was worthy of sharing it with my clan. We arrived after lunch and drove the streets looking for somewhere to park the caravan. Keep in mind, the streets were built at a time where donkey’s ruled the earth by pulling carts. The Urban planners in those days did not share the foresight that today’s planners have. They may have envisioned Oxen pulling carts, but never the Jules Vern version of a caravan. “YES!”, we all cheered the way only Muppets do. If you have ever met my Honey, the you know he has the gift of gab and can make friends with ANYONE. The two struck up a conversation and chatted about the trip, flight, cost of living, plight of the Tiger, parking, and then the question came… Where are you from because I have family in Sherwood Park. You know the sound a needle makes on a vinyl record as it stops? That was the sound in the caravan. The Muppets stopped the boomerang fish from flying, muzzled the chickens, and even Waldorf and Stadler eased up on the wisecracks. THE MAN SAID SHERWOOD PARK! Sherwood Park is a tiny little place east of Edmonton. The entire Muppet Cast, except Honey, was FROM Sherwood Park! What are the chances? SHERWOOD PARK! Suddenly, he was family, we became home sick and no…we didn’t know the brother, but it didn’t matter. We now had a friend and allies who would show us the way to parking! His directions were exemplary. We found caravan parking. We were now able to go out and explore Bruges, sample the best Belgium Waffles dripping in chocolate, eat frits and mayo, indulge in rich creamy coffee and enjoy the wonderful city of Bruges. The swans were beautiful, the Architecture was stunning, the cruise on the canal was enchanting. All because we knew a guy who had a brother that was the neighbor of the sister of someone we didn’t know. 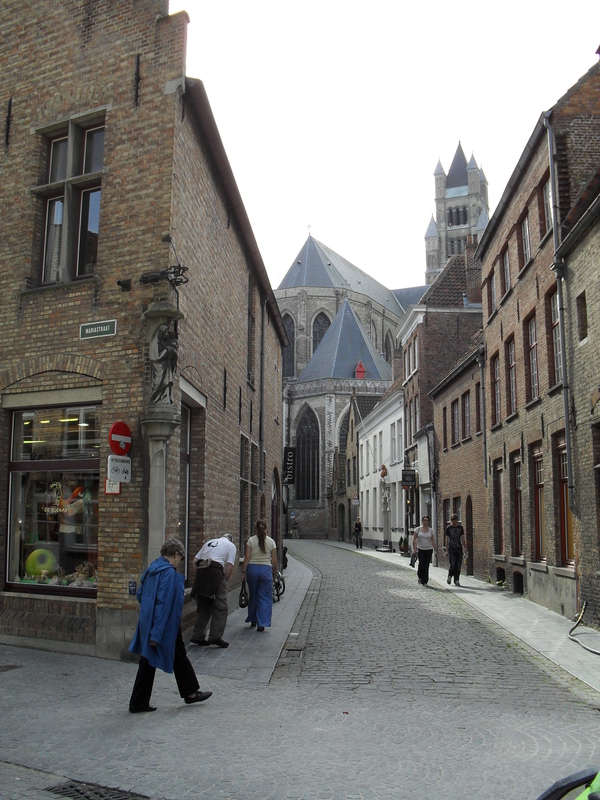 If you ever get to Bruges, ask if you could speak to the Police Officer whose brother is a neighbor of the sister of someone the Edmonton Tourist doesn’t know, and say Hi! < It’s the Most Wonderful Cheg of the Year! Ahhh. 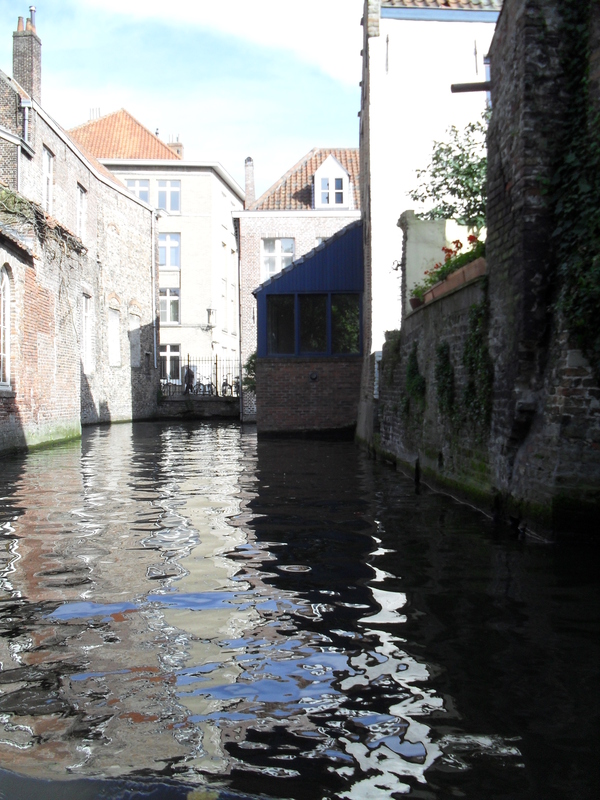 I loved Bruges! So beautiful! Did you go to the store with the Best Hot Chocolate in the World? (that is what the sign says and it is true). That is sooo funny about the Sherwood Park connection. What a small world! ME TOO! 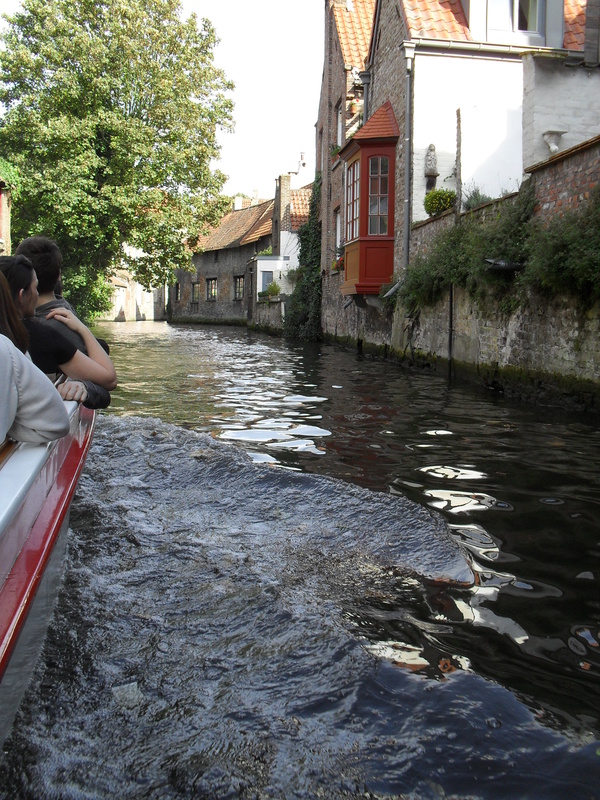 LOVE LOVE LOVED BRUGES!!! We walked by a lot of places that said “the Best Hot Chocolate in the World” 😀 But if you ever watched Elf then you know because someone says they are the best, doesn’t mean they are the best. So we never believed the signs. But had I know they were true this might have been a different story! Now to be fair, I am Canadian, and when I travel I do make an extra attempt to be courteous. Now when ur staring down 2 foreign police officers blathering on at you in Flemish, with occasional finger pointing and arm wavng, you have to be Exteremly courteous. So without any mention of this being “f#####g Bruge” (you have to watch the movie In Bruge to catch my drift), I found a common ground for communication by flashing my Cdn pin. I just wish he’d given us a f-ng map, it would have saved the 1/2 hour walk back to the RV instead of the 10 minuet jog through the centre of town. The world is small indeed! I have often had funny questions when people hear I’m from South Africa – like, “Oh, wow. I’ve been to Mount Kiliminjaro. How amazing is that?” Not so much – that’s like a ten hour flight away from where I live! Hey Sunshine! I know where South Africa is, how amazing is that?! Hop the ferry and go for a weekend. It can be Sooooo romantic! Crazy. I know far too many people who met their mates while traveling and found out they came from the same cities. How anyone can find the other similar aged Winnipegger in Paris, I don’t know? Hmmmm that must be fate, destiny or an aircanada seat sale! Haha small world, right? Love the photographs too! Great story — I love serendipity! Thank you! I love serendipitus stories! is it weird the only reason i want to go to Bruges is to channel colin farrell? congrats on being freshly pressed! I love this – it’s something I experience whenever I’m in the States. I inevitably meet someone who finds out I’m Canadian and asks if I know so and so from such and such. It’s humourous, but I don’t mind. Not that I can’t say it’s a small world. When I visited NYC a number of years ago, my then-boyfriend and I ran into his mother in the subway station on her way to work. Out of the millions of people that travel through the subway system in NYC, what are the chances of that??? Do it!!! The whole experience was enchanting! CONGRATULATIONS ON FRESHLY PRESSED!! Well deserved. All your posts are entertaining and informative. As to your most recent entry, this does happen everywhere I’ve traveled as well. For example in Shanghai, since I was from America I was constantly asked if I knew people from all over the US (Texas, Washington, Virginia) — I live in Cleveland. 🙂 Awesome. Funny blog. Congrats on being Freshly Pressed. I think that happens to everyone everywhere travelling. People will always ask where you’re from in hopes that you know the one person they know from the other side of the country! They do it because they want to feel like they have a deeper connection to that place they visited or know someone from. Belgium is pretty great too. 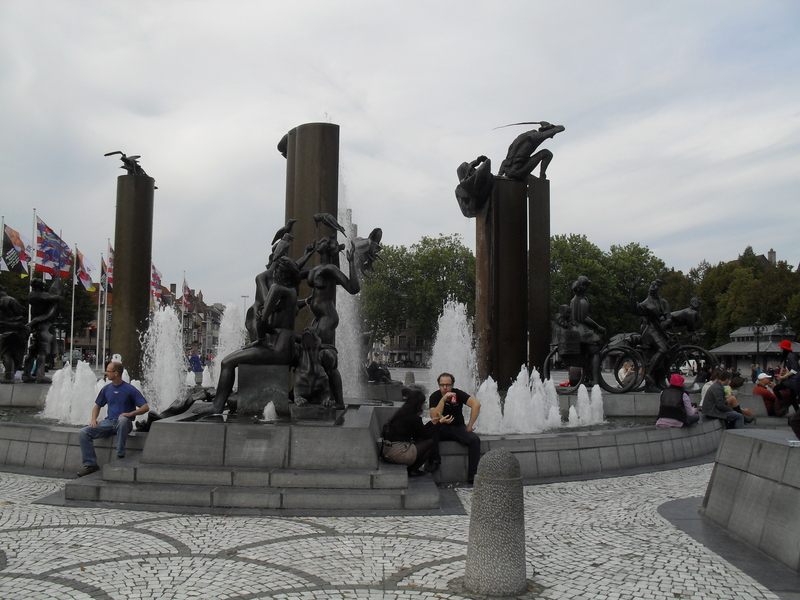 I would love to go back to Brussels and Bruges. Nice photos. Lol your story made me laugh. Loved the pics, thanks for sharing! Great story. My husband’s family are Mennonite. Whenever we meet another person who is Mennonite, we compare names until we find a common denominator. I love that you went across the ocean and found a common denominator. Congrats! Woohoo! Big shout out to Sherwood Park!! I guess it’s not so small after all! Very cool blog and at times it’s a very small world we live in, isn’t it? Congrats on being Freshly Pressed today! My family and i went to Germany a few years back and ran into family friends from home. That we hadn’t seen in a couple of years in Atlanta! I guess the tourist track is the tourist track. Agreed! I love it when stuff like that happens!! …and: also in Australia – we met a work mate of a old fellow student of mine…they worked together in Croatia – but we studied in Munich! Oh so funny!! I’ve been to Brugge too. I didn’t meet anyone’s cousin’s uncle’s brother, but it was a good time nonetheless. 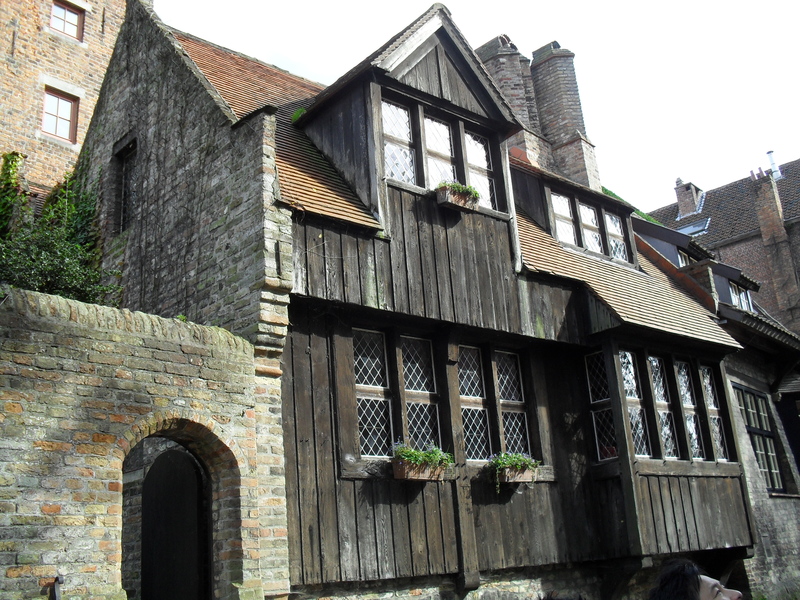 The title and the nice photograph from Brugge made me read your blog. I was born in Belgium where I lived for a long time, moved to Ontario and love Canada and his people dearly. Answered, “Where are you from?” in Texas… and now that I reside in Mexico, it becomes very complicated to give quick answers, but I know what you mean. I have several stories about accidental encounters, I only have to translate them in English. As a Canadian who travels a lot, I appreciate the notion that the world thinks we Canadians are all related to each other in some form or fashion! That’s right, we are one big family reunion! Thanks for stopping by! I live in Mexico, and I get this ALL. THE. TIME. Stranger: You’re not Mexican. Where are you from? Stranger: Well, obviously! I meant what part of the US? Stranger: Wow! I have a cousin in Los Angeles. I don’t recommend it chopping off your foot. Everything in Canada is frozen right now, if you are not use to walking on one foot, you may find it a tad slippery. Ok, I’m officially freaking out. Do you know why? Because last night, when I was writing my post about my super power I was wondering whether you would comment and maybe my power would get you Freshly Pressed. I wake up this morning and read your email notification. And I notice how many comments you have. Now I know you write a great blog, but that’s a few more comments than usual. CONGRATULATIONS on being Freshly Pressed!! This post is wonderful, I love the photos! I’m traveling to korea to meet some relatives i’ve never met. wish me luck. A million thanks for posting this inroomatifn. Did you go to England? Come! It’s cool 🙂 haha nice post! I totally get that about when you travel people will instantly think that you will know their friends neighbours sisters cousin hahaha!! Love your post. I went to school at Ohio State (student population 60,000+) and live in Toronto (population 3 Million+) and when people ask “maybe you know my brother/cousin, etc. ), I try to say with a straight face, “oh yes, I think I did meet her once”. Congrats on being Freshly Pressed. Keep on blogging! I love that you claim to know them! I’m going to start saying that!!! LOL did you really? Too funny! Love your references to your clan as the Muppets. Great pictures…looks stunning! My Swedish MIL wants to visit Bruge and I’ll admit I’m intrigued as well. The pictures I’ve seen (and the movie of course) make it look so charming even if tourist clogged. As for me, I’m an American living in Sweden and it really is a small world. While in a restaurant, our waiter was refilling our drinks when I said something to my husband. He brightened and said, “You’re American! Is that a very faint southern accent, I hear?” His English was flawless. When I said yes, he, of course, asked where I was from. When I told him the Mississippi Gulf Coast, he gave a huge grin and said his mother was from Pensacola, FL. From that moment on, every time we went there to eat, we’d chatter happily with each other about the places we had in common both in the States and here in Sweden. You must make the trip! Bruges is enchanting! I am so happy we went! Ah! What a fun story to read!!! You are a very talented writer, indeed! Congrats on your FP, too!! I live in Germany right now…very close to the borders of Belgium and Luxembourg. We are in a prime location for travel right now and only have another year and a half before we leave to get as much travel in as possible. We’ve made it to Paris, but sadly, Bruges hasn’t made it on our trip agenda yet. But we MUST go before departing Europe!!! So, thank you for sharing your story and your pics! Nice post. 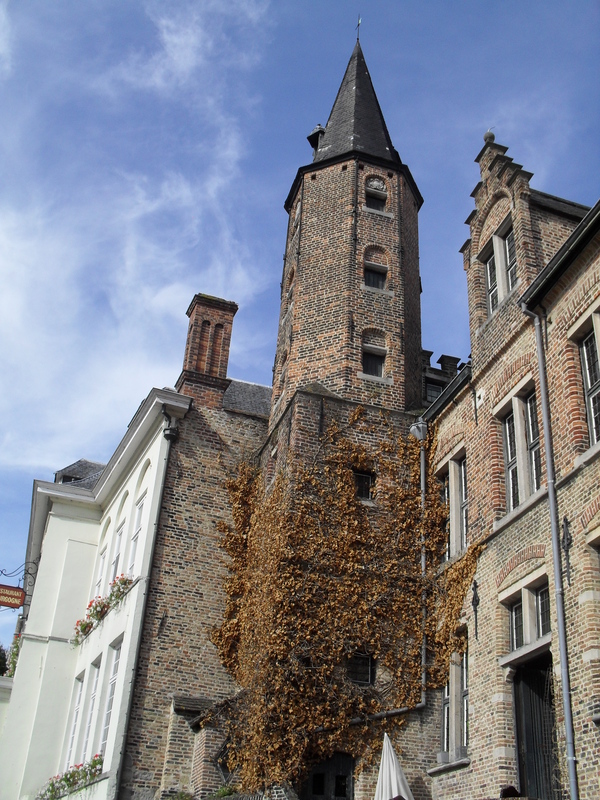 Bruges is a lovely town, went there once with my sister and cousin and I loved it. I never had quite the same experience as you’ve had on travelling, only slightly similar. Many years ago my family went to Spain, we were to borrow the house of a friend of my step-dad, which is located in a tiny, tiny village in Andalucia. Anyways, a couple of days before we were leaving, we were talking to a colleague of my dads (not step-dad, but my real dad), and she asked about our trip. Sis and I told her when we were leaving, and that she’d probably not heard of the town, because it was so small and remote. She said, oh it doesn’t matter, what’s it calle? And we replied Gaucin. Funny thing was, she had just arrived from that town herself, AND she had been living in the exact same house as we were going to borrow. Turned out she was a friend of my step-dads friend. Haha – it’s a small world. I envy all you people that travel everywhere. I’m from Kansas and the only thing I ever hear when I go anywhere is , “You talk funny,” and “Why do you call it ‘pop’ (instead of soda)?” Oh, and, of course, all the “Wizard of Oz” jokes and references to munchkins and tornadoes (which we do have a lot of–tornadoes, not munchkins– but no house has ever fallen on a witch with ruby slippers that I know of, and I’ve lived here all my life). I’m sort of like the little ant or something that explores her own backyard and makes her own world within a two-foot radius. It’s a nice little world though! There is a lot to be said for exploring and appreciating where you live! When I was younger we lived in Hong Kong. The apartment block where we stayed had people from all over the world living there. One day Mum was talking to a lady who she thought came from India. When the lady said she didn’t and she was from a small village that she had probably never heard of. Mum being as curious as she was asked what it was called. The lady told her and then Mum burst out laughing. She told the lady that not only had she heard of it, it was only 2 miles down the road from where we lived. Yes it is a very small world indeed. I have been to Bruges and it is truly breath taking there. Hong Kong is on my list… One day! I think we have all heard that one before……. !! Your blog was brilliant. Almost want to go on holiday now!!! Imagine however, how absolutely awesome it could be if you did happen to know who they were talking about. The chances are that they may not. HAHA. I’m constantly running into friendly Canadians in my travels. I grew up in Ontario and I did have someone in the States ask me if I knew someone they knew in Vancouver and I actually did. It never hurts to ask but it is funny how people assume all Canadians know each other. I love how people think Canada is one big family reunion! It IS nice that assumptions are made to our friendliness. I really enjoy the expressions on peoples faces with the “oh! You’re Canadian!! !” makes me thankful for the Canucks that went before me! It IS a small world. I know the feeling though, and it doesn’t even have to be out of the country. It can be the next state or even town over! And it’s a rarity when someone asks you and you say your from here or there and they all of a sudden exclaim “OH, I’m from there!” or a close relative. But it’s always a great feeling when you can connect with someone like that. Your trip looked lovely! Great pictures! And I’m sure the Muppet Show will have great memories as well! Such a great experience for them! Everyone loves to be connected! The muppets had the best time! They made their own connections and that helped with their measure of a success! Canadian eh! Me too but from Ontario. Great post! My sister moved to Australia some years back and found herself as a travel agent. One day while booking a trip to Spain for a couple she got talking to them as our mother is from Spain. She found out that they were in fact going to the same town as where our mother is from. Turns out my mum was a bridesmaid at their wedding. Needless-to-say my sister was floored! Edmonton seems very nice. In Canada? And where? Wow! I too am a Canadian traveling abroad though a Calgarian – I know, I know, we’re born enemies but I too have family in Sherwood Park! – and have often gotten the “where are you from?” “Canada” “oh, Toronto?” “uhhh no…” “oh Vancouver?” before I give up and tell them Calgary which is often received with blank stares. 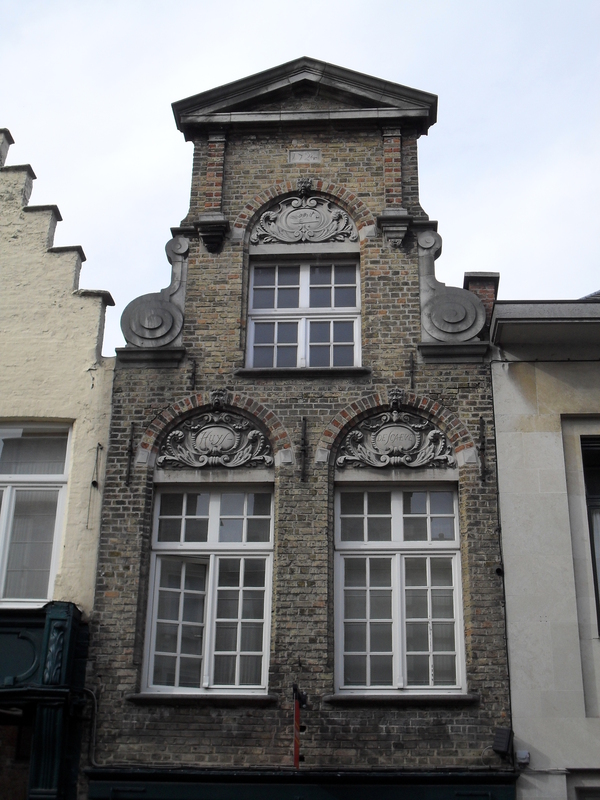 However, I only just decided to do some blog exploring on wordpress and came across this one and have also been to Bruges (and loved it). It was great to see some familiar material from a “local”. What a great read! This is the way I look at it. Calgary and Edmonton are like siblings. We can’t stand eachother at home but when you go out, no one is aloud to pick on the sister but me. So on the world stage, close family. Make sense? No one EVER knows where Alberta is – its our job to educate! Travel on Sista’! I spent the two weeks prior to Christmas in Bruges last year, and my experience was like living in a snow globe–completely magical. With it’s narrow and winding streets, medieval buildings and eerie canals flowing throughout the city, Bruges is unlike anywhere I had ever been. Never been to Bruges (or Sherwood Park) but I really enjoyed this story. The pics are great too. Nice blog, found it over the weekend and found it interesting. ps. Beautiful pics by the way! Thank you for the kind words!! But now I have that Disney song running through my head!! Gave you a link today, perhaps it will generate some more traffic for you. I hope you had a great weekend, and look forward to what you put up next, I snatched a subscription.